The 35 meter long The Junk Thailand liveaboard is a 140-ton three mast junk taking 18 guests on board. She visits the Similan Islands, Koh Bon, Koh Tachai and Richelieu Rock with trip lengths of four-days and four-nights or five-days and six-days. She’s a classic Southeast Asian slice of history and furthermore, a unique vessel in this part of Thailand. She carries plenty of fresh water and fuel to enable her to easily conduct week-long Thailand liveaboard scuba diving itineraries. Guests dive from two rubber tender RIB dinghies for safety and comfort. She carries safety equipment for safe passage at sea including first aid kits, Oxygen, a DAN oxygen kit, two SOLAS life rafts, and SOLAS life jackets. Her communication gear includes VHF radios, CB radios, a GPS, radar, echo sounder and mobile telephones. She offers Nitrox. She has both indoor and outdoor comfortable saloon common areas. You’ll be served five meals and snacks per day on board. The Junk Thailand liveaboard has two cabins with double bed, two three-berths cabins and two four-berths cabins. These are all bunks but can also be sold for two persons as a shared twin. The triple cabin can be a shared twin cabin as well or can be turned into a double bed cabin. All of her cabins are fully air-conditioned and have their own hot water shower and en-suite bathroom. The Junk operates in Thailand from October until May each year. Similan, Koh Bon, Koh Tachai and Richelieu Rock itineraries are four or six days in length. She is available for individual bookings as well as charter cruises. Individual prices are listed below in the schedules. Please contact us for charter prices. All departures are from Phuket, Thailand, serviced by Phuket International Airport. The vessel departs from either Chalong Bay in Phuket, or Thap Lamu, the port just north of Phuket. Transfers are free to and from your hotel or the airport to the boat on departure day. Her sister ship The Phinisi also dives in Thailand but offers Mergui Archipelago itineraries as well. The June Hong Chian Lee is one of several junks built in Penang, Malaysia, and is a 30 meters, 140-ton three mast junk with 330 square meters of sails, Build in 1962 for charcoal transportation the June Hong Chian Lee was part of a small merchant fleet that traded up and down the coastline from Burma to Malaysia. She was mainly used to transport mango wood charcoal till 1985 then she was restored and redesigned for the first time to serve as a classic yacht. In 1997 she changed owners and she was completely restored and set up as a liveaboard vessel. The June Hong is constructed mainly from a hard wood called Takien Tong in Thailand and is ironwood or white thingan. In the late 1980s she was converted to a private yacht and used for scuba diving charters all over the Andaman Coast as well as sunset cruises from her home in Phi Phi Island. 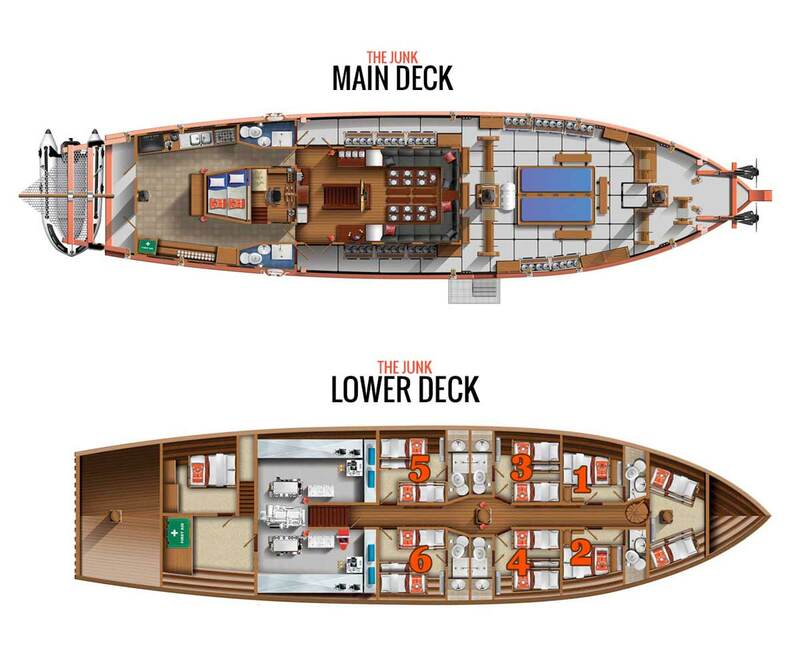 On top were two master cabins and below deck a kitchen, one toilet and many bunk beds all in one open space. Life was still very communal on The Junk. Our company at the time used the boat many times as we had a diving school at the Phi Phi resort where she was based. In 1997, The Junk changed hands. The next owners spent the whole of 1998 restoring and rebuilding her. An old Chinese carpenter came out of retirement to oversee the job. It took a team of about 15 carpenters more than a year to rebuild The Junk. More than 60 tons of teak was used for her restoration. In December 1998 she set off on her first cruise with friends and owners to Myanmar. From January 1999 onwards, she received next set of paying customers who happily went on a truly unique liveaboard cruise to the Similan Islands and beyond. Today she is continually upgraded, a boat like this is a lot of work. She is beautiful and a unique part of Phuket’s past. 16:30 Hotel Pick Ups. Charges apply. Transfers to Hotel or Airport. Charges apply.